We have a large fleet of modern kayaks and two canoes (open boats) that our members can use for a small hire charge. Boats and equipment can be taken the Wednesday before and returned the Wednesday after a trip, you will only be charged for the days you paddle. 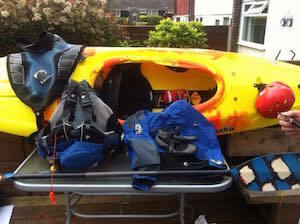 All other equipment such as paddles, buoyancy aids and helmets are provided to members free of charge. Please bear in mind that you are responsible for all club equipment whilst it is away from the club. Club equipment cannot be taken away from the club for longer than 1 week (Wednesday to Wednesday) and cannot be taken until after the Wednesday club session finishes and must be returned on time to be used in the following Wednesday club session.